Portrait of Urban II, attributed to Sacchi, circa 1632. 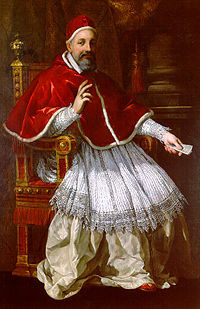 Pope Urban VIII (April 1568 – July 29, 1644), born Maffeo Barberini, was Pope from 1623 to 1644. He was the last Pope to expand the papal territory by force of arms, and was a prominent patron of the arts and reformer of Church missions. However, the massive debts incurred during his papacy greatly weakened his successors, who were unable to maintain the Pope's longstanding political or military influence in Europe. He is famous, or infamous, for condemning and imprisoning Galileo. He had actually given permission for Galileo to publish his theory but as theory, not fact. It was less what Galileo wrote than the fact that he had been warned not to do that upset the Pope. The debts he accrued had paid for building and Baroque cultural artifacts to express the prestige of the papacy. However, behind this bold statement of power lay deep uncertainty as the new humanism of the Enlightenment questioned old assumptions. The tendency was to retreat into an authoritarianism that was out-of-step with the spirit of the age. As a nepotist and spendthrift, Urban easily attracts criticism. Yet in both of these he but followed the example of many of his predecessors. Like them, imperfect though he was, he tried to protect the authority of the papacy against what he saw as potentially endangering this. For most of his predecessors, this had been the power of kings and the papacy's vulnerability to physical, military attack. Now, it was the threat of ideas. Later, ways would be found to reconcile the teaching of the Bible with science by seeing the former as a theological not a scientific text, which, read a metaphor, analogy and as spiritually but not literally true, does not clash with science but adds a spiritual dimension. In 1601, Maffeo was able to use the influence of an uncle who had become apostolic protonotary to secure an appointment by Sixtus V as papal legate to the court of King Henry IV of France. In 1604 Gregory XIV appointed him archbishop of Nazareth, although this was an honorary position as the Holy Land was under Turkish rule. By Clement VIII he was himself made protonotary and nuncio to the French court; Paul V also employed him in a similar capacity, afterwards raising him to the cardinalate and making him the papal legate to Bologna. On August 6, 1623, he was chosen successor to Gregory XV and took the title Urban VIII. Urban's papacy covered twenty-one years of the Thirty Years' War and was an eventful one even by the standards of the day. He canonized Elizabeth of Portugal and Andrew Corsini and issued the Papal bull of canonization for Ignatius Loyola and Francis Xavier, who had been canonized by his predecessor, Gregory XV. Despite an early friendship and encouragement for his teachings, Urban was responsible for summoning Galileo to Rome in 1633 to recant his work. He declared that Galileo had "dared to meddle with matters beyond his competence," and had him imprisoned. What actually infuriated the Pope was less Galileo's "heliocedntric theory" but that he taught this despite having been warned not to do so by the Inquisition. Urban was prepared to forgive "error and conceit" but not "deliberate defiance of ecclesiastical authority." Duffy suggests that beneath the "astonishing projections of the Baroque-papacy's self-image" lay deep uncertainty as Enlightment knowledge began to question old assumptions, so it resorted to the "peremptory exercise of authority." Earlier, Urban had given Galileo permission to publish his ideas, as long as he did so as hypothesis. He was the last to practice nepotism on a grand scale: various members of his family were enormously enriched by him, so that it seemed to contemporaries as if he were establishing a Barberini dynasty. Urban was also a clever writer of Latin verse, and a collection of Scriptural paraphrases as well as original hymns of his composition has been frequently reprinted. Urban VIII issued a 1624 papal bull that made smoking tobacco punishable by excommunication. The ruins of the Jesuit missions in Paraguay. A 1638 papal bull protected the existence of Jesuit missions in South America by forbidding the enslavement of natives who joined a mission community. At the same time, Urban repealed the Jesuit monopoly on missionary work in China and Japan, opening these countries to missionaries of all orders. He thus oversaw the expansion of the church overseas. Although missionaries were sometimes agents of imperialism, who devalued and even helped to destroy local cultures and sometimes, if not intentionally, populations, the Jesuit missions supported by Urban were among the most humane and culturally open, producing almost idyllic autonomous, economically viable communities, known as Reducciones. Urban's military involvement was aimed less at the restoration of Catholicism in Europe than at adjusting the balance of power to favour his own independence in Italy. In 1626 the duchy of Urbino was incorporated into the papal dominions, and in 1627 when the direct male line of the Gonzagas in Mantua became extinct, he controversially favored the succession of the Protestant Duke of Nevers against the claims of the Catholic Habsburgs. 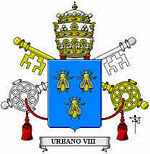 Coat of Arms of Pope Urban VIII. He was the last Pope to extend the papal territory, and fortified Castelfranco Emilia on the Mantuan frontier and the castle of Sant'Angelo in Rome. Urban also established an arsenal in the Vatican and an arms factory at Tivoli, and fortified the harbor of Civitavecchia. For the purposes of making cannon and Vatican decoration, massive bronze girders were pillaged from the portico of the Pantheon, leading to a famous quote quod non fecerunt barbari, fecerunt Barberini, "what the barbarians did not do, the Barberini did." In addition to these warlike activities, Urban patronized art on a grand scale. He expended vast funds to bring polymaths like Athanasius Kircher to Rome, and painters Nicolas Poussin and Claude Lorrain, architects Bernini and Borromini were commissioned to build the Palazzo Barberini, the college of the Propaganda, the Fontana del Tritone in Piazza Barberini, the Vatican cathedra and other prominent structures in the city. In 1629, he appointed Bernini chief architect of St. Peter's. He worked on such projects as the restoration of St, Peter's throne, and the collanade surrouding the forecourt and on many other decorative features. Outside the Vatican, Bernini built fountains and churches, all in Baroque style. Pietro da Cortona embellished the gran salon of his family palace with an apotheotic allegory of the triumph of the Barberini. A consequence of these military and artistic endeavours was a massive increase in papal debt. Urban VIII inherited a debt of 16 million scudi, and by 1635 had increased it to 28 million. By 1640 the debt had reached 35 million scudi, consuming more than 80 percent of annual papal income in interest repayments. Urban saw these Baroque creations as an expression of the prestige and authority of the papacy. Duffy, however, suggests that this was bluster, covering a deep uncertainty about whether the world did operate according to the rules that the Church supposed it did. Urban' death on July 29, 1644, is said to have been hastened by chagrin at the result of the First War of Castro, a war he had undertaken against Odoardo Farnese, the Duke of Parma. Because of the costs incurred by the city of Rome to finance this war, Urban VIII became immensely unpopular. On his death, the bust of Urban that lay beside the Conservator’s Palace on the Capitoline Hill was rapidly destroyed by an enraged crowd, and only a quick-thinking priest saved the sculpture of Urban belonging to the Jesuits from a similar fate. He was succeeded by Innocent X. Urban VIII may be remembered mainly as a spendthrift and for his silencing of Galileo. His tomb was designed by Gian Lorenzo Bernini, his own appointee as chief architect at St. Peter's. In addition to the works of art he commissioned, his legacy has other positive aspects. His support for missions, especially his opening up of China to missionaries from any society and order, resulted in bringing many people into membership of the Catholic Church. The Catholic Church over which he presided was still a mainly European community. Within the next two centuries, its membership in Africa, Asia and the Americas would grow into the majority, making it more universal and also more tolerant of diversity within unity. Francis Xavier, whom Urban VIII canonized, had embraced many aspects of Indian and later of Japanese culture, and was sympathetic towards some of the religious beliefs and practices he encountered. Led by Xavier, many Jesuits came to believe that while the Gospel must transform societies, Christians need not "reject as worthless everything that has come before." Indeed, some of his Japanese converts may well have thought that they had converted to "a new and superior kind of Buddhism." Also, Urban had showed initial openness to Galileo's ideas even though he later resorted to authoritarianism, faced what he saw as a threat to the way the Church thought the universe worked. This willingness to at least contemplate the possibility of a different way of looking at the world would take time to become the dominant mode of Catholic thought, yet at Vatican II fresh interpretations, including how the Church viewed other religions, would breathe new life into a Church that some had written off as too out of tune with the times to survive. Like all Popes, good and bad and indifferent, it was the Church's survival that motivated Urban's less self-indulgent achievements. ↑ Ruth Gledhill, "Catholic Church no longer swears by truth of the bible," The Times (of London) October 5, 2005, Catholic Church no longer swears by truth of the Bible Retrieved February 10, 2008. A document, The Gift of Scripture, published by the Catholic Bishops of England and Wales, with Vatican approval, shows "how far the Catholic Church has come since the 17th century, when Galileo was condemned as a heretic for flouting a near-universal belief in the divine inspiration of the Bible by advocating the Copernican view of the solar system." The bishops said, "We should not expect to find in Scripture full scientific accuracy or complete historical precision,” they say in The Gift of Scripture." ↑ Michael T. Ott, "Pope Urban VIII" The Catholic Encyclopedia, Volume XV. NY: Robert Appleton Company, 1912. Pope Urban VIII Retrieved February 10, 2008. ↑ 5.0 5.1 5.2 Al Van Helden, "Pope Urban VIII Maffeo Barberini (1568-1644),” The Galileo Project, Rice University, 1995, Pope Urban VIII Retrieved February 10, 2008. ↑ James Mooney, "Guaraní Indians," Catholic Encyclopedia Volume VII. NY: Robert Appleton Company, 1910, Guaraní Indians Retrieved February 10, 2008. Maxwell-Stuart, P.G. Chronicle of the Popes: The Reign-by-Reign Record of the Papacy over 2000 years. London: Thames & Hudson, 1997. This page was last modified on 12 January 2016, at 15:37.